When these trends are identified in normal market conditions, out-of-the-money strikes can be sold and option premium + share appreciation will bring our monthly returns into the 3-4% range and higher. As they say on Wall Street, “The trend is your friend”. The green circles demonstrate areas of support. Note that in early August (purple double-side arrow) the chart shows that the price of this stock had a large drop on high volume. The price temporarily dropped below the 20-d ema. This was the result of an earnings report and exemplifies why we avoid equities that are reporting earnings in a particular contract period. These reports can surprise in either direction resulting in extreme volatility and price movements. STEC reported earnings on August 4th and the market reacted negatively. Those who follow the BCI methodology would not have owned this stock at that particular time and would not have suffered any short-term losses. Sell O-T-M strikes when we have identified an uptrending moving average in normal market conditions. Avoid equities in a downtrend. Avoid the stock or sell I-T-M strikes when stocks are trading sideways (consolidating) or not in any particular trend. If a stock breaks through support (moves down) on high volume, be prepared to execute an exit strategy. If a stock breaks through resistance (moves up) on high volume, consider this a major technical positive. Moving averages are effective tools for identifying and confirming trends as well as support and resistance. This facilitates our trading system as it assists in making our buy-sell decisions. Since it is a lagging indicator, it is not predictive of change as let’s say the MACD is. But as was stated before, “the trend is your friend” and we want as many friends as possible when investing our hard-earned money. As with all technical tools, moving averages should not be used alone, but rather in conjunction with our other technical indicators. Thanks for making my first two books #s 1 and 2 on the subject of “covered calls” on Amazon.com with my latest book, Alan Ellman’s Encyclopedia for Covered Call Writing ranked # 5. For the week, the S&P 500 fell by 0.5% for a year-to-date return of 13.8%, including dividends. BCI: Moderately bullish favoring out-of-the-money strikes approximately 3 to 2. The Weekly Report for 08-24-12 has been uploaded to the Premium Member website and is available for download. FIRE is on our current watch list in bold this week but wasn’t last week. Is there a way of telling what changed to get it on the list? Thank you. The difference between this week and last week is that the Stock Scouter rating has improved. A stock must have a Stock Scouter rating of 5 or better to pass the Risk/Reward screen. The Weekly Stock Screen is an educational tool that has been requested by our subscribers from the beginning. It takes the reader through each step of the screening process for the IBD 50 and “Other” for the current week. I hope this helps. If not, please get back to us and we’ll work until your question is answered. If a stock drops below support would you automatically use an exit strategy or would you wait for the 20-10 rule to be met? Thanks. A minor breach of the 20-d EMA is NOT automatically a reason to close the short options position. Prices may dip below this technical parameter briefly and then recover, so losing a high percentage of our initial option profit may not make sense. I use the 20%/10% BCI guideline as my first determination to institute an exit strategy. Of course, if unexpected negative news comes out and the price plummets, all bets are off and an exit strategy needs to be executed. Usually, not in the case of a small breach. I’ve created a chart for ALXN a stock on our premium watch list for 9 weeks. Check the 3 red arrows and note how there was a brief decline under the 20-d EMA and then an instant recovery. If we followed the 20%/10% guideline, our positions would not have changed and our profits not impacted negatively. CLICK ON THE CHART TO ENLARGE AND USE THE BACK ARROW TO RETURN TO THIS BLOG. Before trading we have to decide how much money we are prepared to risk. I am wanting to use the very minimum amount possible first, and then build it up if things went well. – What do you think is the minimum amount of money I can use, for starting off selling covered calls. (and to buy shares)? – What is the amount of money you think is a “best” amount to start out with (buying shares)? We have some members who use the SPDR Select top-3 from our premium member ETF report. By investing in these securities, you will have exposure to the top-performing one third of the S&P 500. The investment will be a lot less than required for 5 individual equities. The tradeoff is that ETFs return a lower premium percentage than individual equities. But it is a good place to start for many newbies. The “best” amount to invest really depends on your personal financial situation and risk-tolerance. Although covered call writing is by far my favorite form of investing, I am a strong believer is asset allocation. My portfolio also includes a large real estate holding, bonds (yawn) and cash-equivalents in addition to my dental practice. I would set my goal to be as diversified as possible regarding asset classes in addition to stock and industry. This may take time but we need to set our goals in order to achieve them. The monthly cash generated from selling calls can be used in different ways. When I first started I used the cash to help fund my sons college and professional school educations. Now that they’re “off the payroll”, I re-invest the profit to benefit from the power of compounding. Again, this is an individual decision. Is there a way to predict if an option will be exercised early and our shares sold? Thanks for all you do. The chance of early assignment prior to expiration Friday is EXTREMELY remote. Here’s why: An option premium will almost always have a time value component to it, even on expiration Friday ($0.05 – $0.10). In your example, the option is $1.50 in-the-money (intrinsic value). Let’s say that early in the contract, the time value is $1.00 so the total premium value is $2.50. Now the option holder can exercise the option and buy your shares for $40 and sell at market for $41.50, generating a profit of $1.50. OR he can simply sell the option he bought for $2.50. Unless the option buyer is clueless, he will always opt for $2.50 over $1.50. The key is his loss of time value. The rare exception to this rule is when there is a dividend distribution prior to expiration Friday. If that dividend is greater than the loss of time value, there is a possibility of early assignment. If this occurs and there is not a tax penalty…so what, we’ve maximized our 1-month investment! 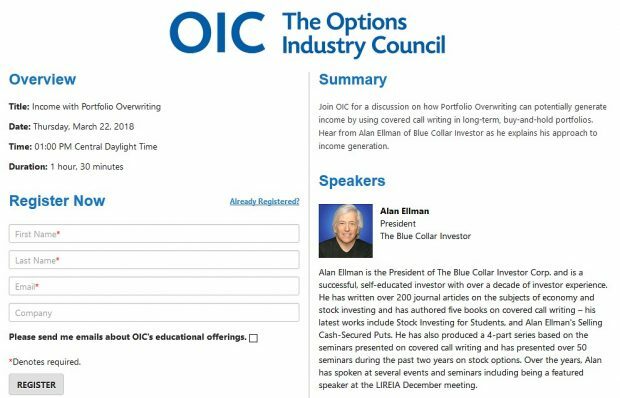 Alan, when you said that we could use “$20,000 – $25,000 for individual equities” then can I use $20,000 over 5 stocks(so $4,000 per stock), or do you mean this amount per stock? – I have read somewhere that we can either sell covered calls for income(pay living expenses,etc), or to create wealth (by reinvesting), but not do both. Would you agree with this? (I think this is only for investors just starting out with small accounts)? Which of these 2 options do you think is best to do? (I was thinking to do this strategy for income first,- as it would free up more time from work)? – Also is it true that we can only make money 6-9 months/year selling covered calls. (this is what I heard from a DVD I watched)? 1- $20k – $25k is the MINIMUM for 5 stocks. The BCI methodology requires a minimum of 5 stocks in 5 different indusrties for diversification purposes (when not using ETFs). Since one contract consists of 100 shares, this would require our underlying securities to averagre $50 per share or less. 2- I think of covered call writing as an income stream, the same as if I worked another job. This can be used for living expenses or for compounding to create wealth or BOTH, why not? Years ago I used covered call writing to help fund my sons college and professional school tuitions. Now I re-invest to take advantage of the enormnous benefits of compounding. I could easily continue re-investing while at the same time taking out $1000 to go on a cruise. This is a personal decision based on your family’s needs and only you can determine which is better. A master of covered call writing should generate profit in the first 4 of these 5 scenarios. In either case, if you are new to this strategy paper-trading comes first.